Are you in search of a table tennis racket that will improve your balance? Would you like to own a table tennis racket that will also improve your speed and control? Well, you are in luck because today, we will be reviewing the Stiga supreme table tennis racket. As a first time shopper, shopping for the best table tennis racket is a daunting task. To help you make the right decision when shopping, we have compiled this informative review. 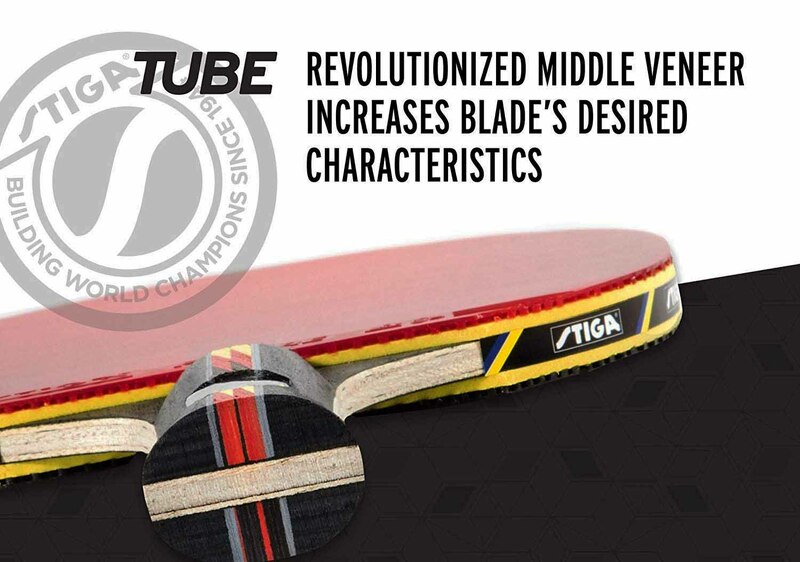 In our Stiga supreme table tennis racket review, you will learn about its features, pros, cons, why we recommend it and many more. 1 Why do I recommend the Stiga Supreme Table Tennis Racket? 1.1 Stiga Supreme Racket is best for whom? 1.2 Why this racket not for everyone? Why do I recommend the Stiga Supreme Table Tennis Racket? Having had a first-hand experience using the Stiga supreme table tennis racket in several friendly tournaments, I highly recommend this racket to beginners and intermediates. Want to know why? I have compiled four reasons that will help to explain why I recommend this top of the line table tennis racket. One of the reasons I loved about the Stiga supreme table tennis racket is the high-quality build. Unlike other models, the Stiga supreme table tennis racket is made with 6 ply extra blade with future inverted ITTF approved rubber. A 2 mm sponge is also included to improve your performance when playing. Apart from improving your performance, the use of high-quality materials helps in the absorption of vibration and results in the transfer of energy out of the handle. When you take a quick look at the Stiga supreme table tennis racket, you will immediately notice the well-rounded shape of the paddle. Thanks to the creative design, the table tennis racket has a performance rating of 89 for control, 92 for spin and 90 for speed. Not only that, the creative build of the Stiga supreme table tennis racket assures you of better balance, better recovery rate, and improved ball sensitivity. Now you can improve your performance as you practice and play in more tournaments. Just like the blade, the handle is made with high-quality materials too. For starters, the manufacturer began by incorporating revolutionized veneer in the midsection. The reason for using veneer in the midsection was to increase the blade’s desired characteristics. To harden the outer part of the blade, the manufacturer used Stiga crystal technology. The reason for doing so was to harden the blade helping you make quick shots. The first time I took hold of the Stiga supreme table tennis racket, I was amazed by its weight. Unlike other table tennis rackets which I used before and were a little bit heavy, the Stiga supreme table tennis racket was lightweight. Weighing less than 4.8 ounces, the lightness of the table tennis racket contributes greatly to the player’s performance. For starters, it improves the player’s balance and control. In addition, it also improves the player’s recovery rate. Stiga Supreme Racket is best for whom? From my experience with the Stiga supreme table tennis racket, I can confirm that it is best suited for beginners and intermediates. Want to know how I came about to this decision? For starters, the manufacturer has fitted the blade and the handle with revolutionized middle veneer. This was done to increase the table tennis racket performance, balance, control, and recovery rate. That is not all. The table tennis racket absorbs vibrations and transfers the energy via the handle. When it comes to the rubber and sponge combination, they are bonded well on both sides of the table tennis racket. As a result, the table tennis racket has the following rating – 90 for speed, 89 for control and 92 for the spin. As a player, you can service returns, chop and backspin all your shots back to your opponent. If you prefer a defensive gameplay, then this is the perfect tool for you. Why this racket not for everyone? As said earlier, the Stiga supreme table tennis racket is best suited for beginners and intermediates who prefer defensive gameplay. Yes, pros can use it but it will limit their performance even though the table tennis racket is built with high-quality materials. Professionals require a much lighter table tennis racket that will not only improve their performance but speed, control and balance too. That is not all. A pro’s table tennis racket should have the following rating – 10/10 for speed, 9/10 for spin and 6/10 for control. Q: What is the ACS technology? Answer: The Air Capsule System refers to technology where numerous microscopic air capsules are incorporated in the ultralight rubber. This improves the performance of the blade and allows for better control. Q: What does speed mean? Answer: The speed rating of a table tennis racket refers to the pace of the ball during gameplay. This is determined by the type of wood and other materials such as rubber and sponge used in the making of the table tennis racket. Q: After how long should I change my rubber sheets? Answer: The life expectancy of your rubber is depended on the frequency of use. The more you play, the more the rubber sheets wear out. The Stiga supreme table tennis racket is undoubtedly one of the best paddles for beginners and intermediates. Designed with high quality revolutionized veneer and wrapped with ITTF rubber sheets and sponge, the table tennis racket offers the best performance. While it does not provide much spin, the Stiga supreme table tennis racket is capable of producing more power, speed, and control. In addition, the handle design allows for better recovery rate which improves your performance. Designed for defensive players, the Stiga supreme table tennis racket is best suited for beginners and intermediates too. So, if you want to fast track your progress of becoming a professional table tennis player, I highly recommend the Stiga supreme table tennis racket. Idoraz Table Tennis Paddle Review: Should You or Not?